"The biggest crop we've had for years is firewood," said Mark Linshield Lineshield through tears. "And that's what's burning down there right now. So...that's a total loss." Fire crews Monday stopped the forward rate of spread of a brush fire in the San Pasqual Valley. The blaze, dubbed the Cloverdale Fire, burned 100 acres and is, as of 7 p.m. Monday, 15 percent contained. ESCONDIDO, Calif. (KGTV) -- Fire crews Monday stopped the forward rate of spread of a brush fire in the San Pasqual Valley. The blaze, dubbed the Cloverdale Fire, burned 100 acres and is, as of 7 p.m. Monday, 15 percent contained. 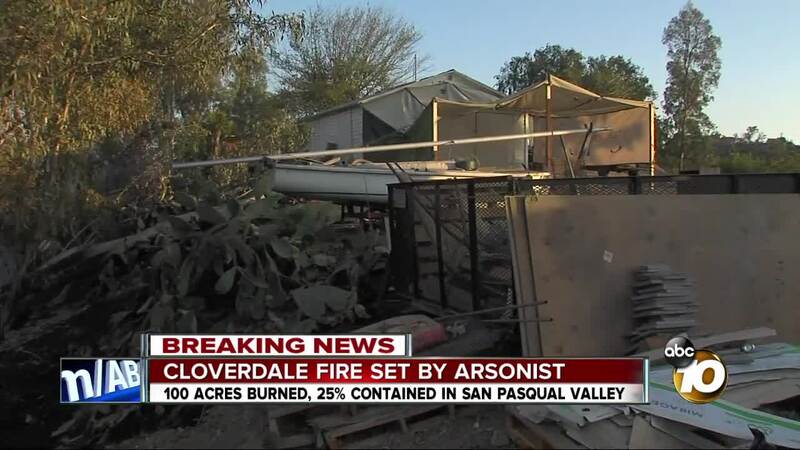 The fire broke out on the 21000 block of San Pasqual Road around 3 p.m. near Hungry Hawk Vineyards. Arson investigators determined that the fire was intentionally set, the San Diego Fire-Rescue Department announced in an Instagram post Monday night. A San Diego firefighter suffered a minor injury and was treated at the scene. Evacuation warnings were issued for part of San Pasqual Road, Rockwood Road and Brillwood Hill Road. 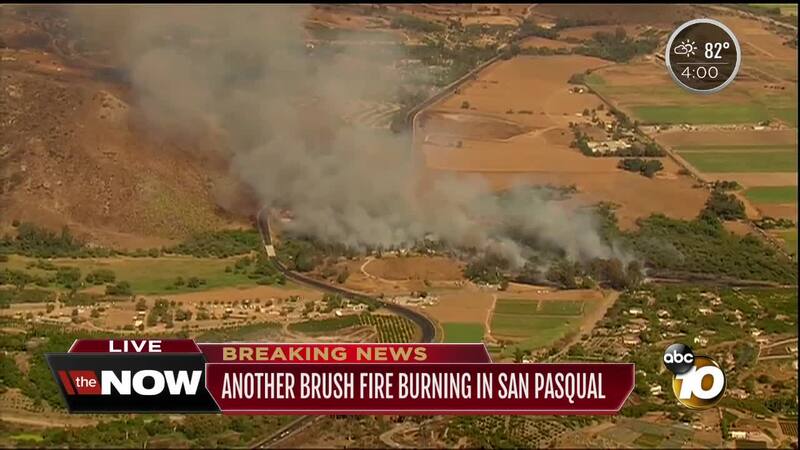 The San Pasqual High School opened for those who evacuated. All lanes of SR-78 east of Safari Park and Cloverdale Road also had to be shut down due to the blaze. The San Diego Zoo Safari Park, which is located roughly five minutes away from where the fire started, evacuated guests Monday afternoon due to the closure of SR-78. The park was also prepared to evacuate animals, but did not have to do so. In an evening update, the Safari Park announced that it would be open as usual to guests on Tuesday. Highway 78 is expected to be open in both directions by early morning. The National Weather Service tweeted out a photo of the blaze when it first started as seen from the NWS office. The SDG&E aircrane was also dispatched to the blaze to help firefighters battle the Cloverdale Fire. Along with the aircrane, three helicopters and two fixed-wing aircraft were sent to fight the fire. The blaze comes just days after the Rangeland Fire scorched 250 acres on the same hillside already blackened by the Pasqual Fire that tore through the area in late July.